The crazy thing about living in Los Angeles is probably that I don't even get to see the award shows because of the time zone difference. I wish they would telecast the award shows live so we can actually see what happens before heading off to celebrate. Ideally, when I moved out here, I wanted to get invited to all the award show after parties. Those are fun to me, mostly because you get to see celebrities, but also before you get a ton of a free crap. And who doesn't love free swag? I can say, now, that I've been to more than a dozen award parties and no matter how many more I'll go to, I'll always act like that idiot who has never had a swag bag before. Last night, Nat and I were high fiving each other once we pulled out the Rembrandt Whitening Strips. Honestly, I should never pay for beauty products again in my lifetime. 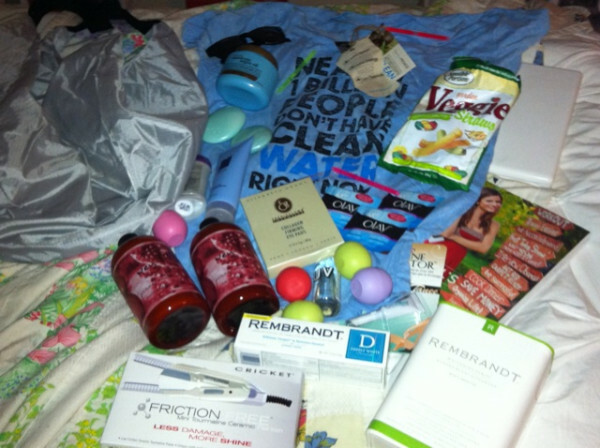 I have piles of product from PR firms and swag bags all over my room. I know, embarrassment of riches. I feel very blessed. But yeah, we made such a spectacle regarding our swag bags that the photographer from InTouch came over and asked us to reenact our glee because he wanted to take some photos. I felt very much like Heidi and Spencer. 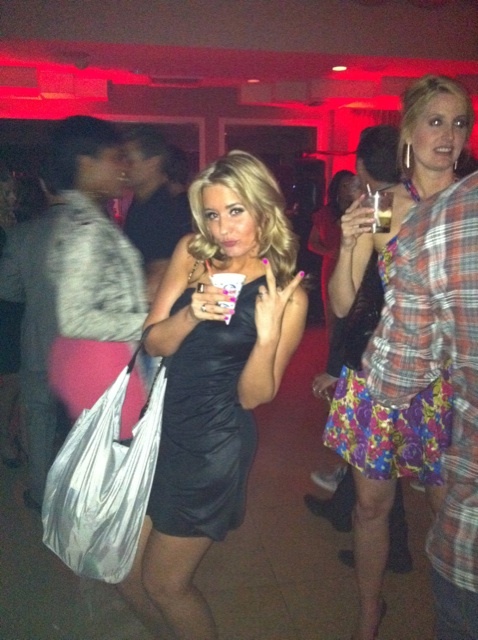 So I guess I can confirm that last night we attended the InTouch Idols and Icons VMA After Party at Sunset Towers. Upon arrival, we walked past Kasey and Vienna from Bachelor Pad. Vienna is interesting because she acts just like she does on the show. Take that as you will. We also whisked by Melissa, the nutcase, who is unbelievably skinny but pretty. She kind of has a Gwyneth Paltrow thing going on. I took this as my cue: we were at Bachelor Pad? I couldn't be certain. I was hoping we weren't due for a "strip down to our skivvies" session to be pelted by paint balloons. Shockingly, Jack Pavelka was nowhere in sight. I set up shop at the Candy Bar because, obviously, I love sweets. They had rock candy which reminds me of my childhood, but it also turned my mouth green so I had to put a swift end to that. Womp womp. Other notables: Kendra showed up and literally the girl looks like a My Size Barbie. She's lost all the weight from her pregnancy and is looking fine, fresh and fierce. We had a goal to take a shot with her, but then again I'm not a creepazoid that interferes with celebrities. I quietly look on and would rather not be the dipstick that asks for photos and autographs. 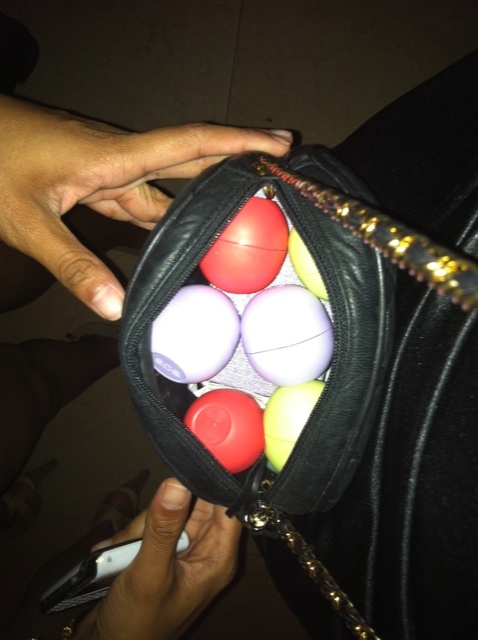 An added benefit to this party: it was sponsored by EOS lip balm, which I'm borderline obsessed with (Summer Mint is my favorite). The entire night, girls came by with trays filled with different flavors, so Nat and I continously kept grabbing them. 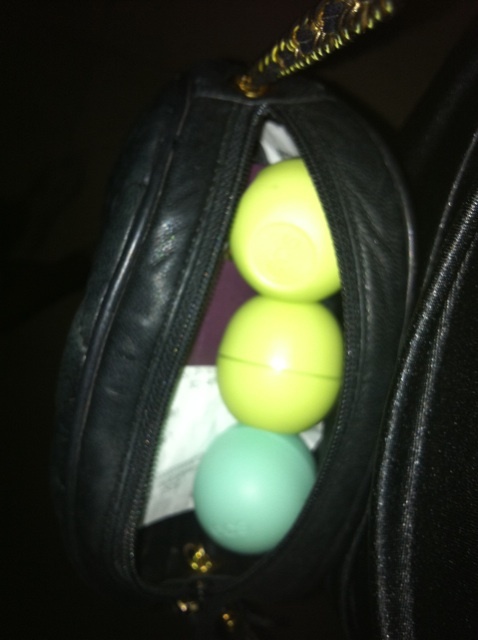 Really, my purse looked like an Easter basket. We managed to fit 14 in there at one point. They also handed out super cute EOS lotion. After being offered and graciously accepting more than our fair share of lip balm ("You'll never pay for lip balm in this town again! "), we ran around drinking some cocktails and enjoying the tunes of DJ Mom Jeans, among others. The party was also sponsored by UV vodka, who featured their cake flavor, which surprising tastes exactly like cake. 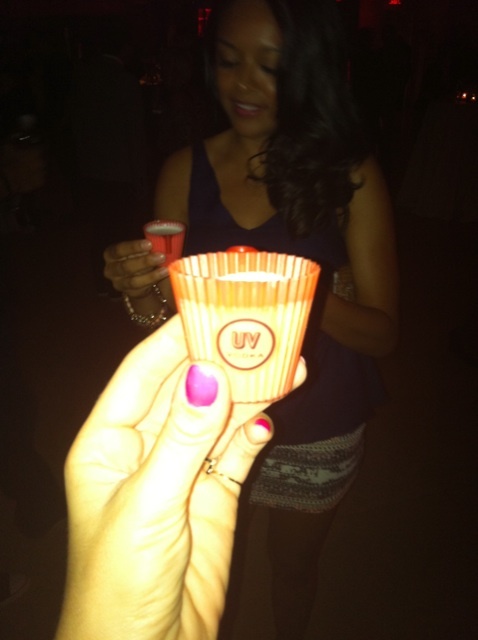 They had these adorable little cupcake wrapper shot cups for us to take them out of. In the midst of the chaos, JC Chasez ran by us. This sparked an immediate look at Nat which resulted in a fit of laughter, only because everyone made fun of me regarding my infamous "Kiss victory signal" I gave after laying one on his cheek, 12 years ago. I strongly considered showing him the video on my phone but decided not to risk my dignity in the process. Other celebs include the dude from The Blind Side (I'm too lazy to look him up and can't remember his name) and the hottie from Grey's Anatomy. Not McDreamy or McSteamy. The newer one with a dark complexion and light eyes. Again, too lazy to look. Jersey Shore was supposed to show, by my feet were about to amputate themselves so we called it a night shortly after 12:30, after getting way too psyched about the swag bag and indulging in a Frozen UV Coconut vodka snocone. It was delicous and perhaps my replacement for the Ciroc Obama, given Ciroc Coconut has been discontinued. Today, Joel and Benji Madden eating lunch at Urth Caffe in WeHo. I wonder if they waited 30 minutes to get a salad, like I did. Miley Cyrus came into work on Friday. I was way too thrilled with myself. Not like I had anything to do with her coming in, but still. I've never seen her before, and I always forget that she's not even 20 yet. She's very pretty in person. I always say that, but really, she was. At the Falling Whistles event a few weeks ago, I met Vanessa Lengies, the new tone-deaf character on Glee. Adorable much? And that'll do for now. A pretty exciting couple of a weeks and with so much to look forward to this fall. WOW!!! You look so amazingly stunning in that dress!! !